News Flash, Parents…. Everyone is strong-willed. And that’s the problem with the way so many parents today explain away their children’s behavior. They describe their children as strong-willed as though their children are special, unique snowflakes beset with passions and urges that no other children are. It’s like describing rain as “wet”. “The streets are slippery today….THIS rain is really wet.” ALL RAIN IS WET. Or describing a mirror as “reflective”. “Hello shopkeeper, do you have any reflective mirrors I could purchase?” ALL MIRRORS ARE REFLECTIVE. Or describing your disobedient child as “strong-willed”. ALL CHILDREN ARE STRONG-WILLED. No, parents, your children are no more strong-willed or bull-headed than anyone else’s children. Other parents just cope with their children better than you. And that’s a cold, hard fact. But, you say, I have multiple children and they’re all different. My response….Duh. Of course children are different. They are, after all, miniature adults. And as miniature adults they reflect the same personalities that you encounter among your adult friends. And all of your adult friends are strong-willed. Take my children for example…. KicksTheBall is “strong-willed” in the typical sense of the word, in that he has the capability to act like a little heathen. He can run and scream and fight and be as disruptive as any child alive, which is a complete contrast to ReadsTheBooks. ReadsTheBooks is about as passive a young man as you’ll find. I can tell him to mow the yard or that we’re going out for donuts and get the same head nod and the same, “OK, cool.” response from either statement. He’s not “strong-willed” in the sense that many parents use that term. But woe unto the parent who asks ReadsTheBooks to make a decision. Give him three options on where to go out to eat, and tell him that his parents and brothers have chosen different options…..make ReadsTheBooks the tie breaker and watch him flounder. He’ll pace the floor, weigh his options, work himself up into a fit trying to decide and when forced to make a decision will finally shout in frustration, “I don’t know!”. ReadsTheBooks is strong-willed, just in a different way. He’s compliant in issues of obedience, but it’s nearly impossible to get a decision out of him. His will is set to try to please everyone and if that’s impossible, the “strong-will” of his personality is seen in his refusal to make a decision. And that’s a perfect example of how all parents are strong-willed. I was initially going to title this There are no strong-willed children, Only weak-willed parents. But the more I thought about that statement the more I realized that it just isn’t true. All parents are strong-willed, being essentially larger versions of the personalities seen in their children. Just like ReadsTheBooks is strong-willed in his own way, many parents are just strong-willed in a different way than you might expect. Take, for instance, the parent of a disobedient child. The child may be rambunctious during a church service, in trouble at school, disruptive in a restaurant, or generally just a pain to be around. The parent knows and realizes these things, they’re painfully obvious even to the most oblivious of parents. The parent knows that their child’s behavior is unacceptable-The stares of strangers, the rebuke of the experienced and sudden infrequency of invitations to visit with friends have all made that plain to see. to correct their child’s behavior. Why is that? Why would a parent lose friendships, attend constant meetings with teachers, be embarrassed nearly every time they go out into public and not do anything at all to address the source of all this trouble? Because the parents are too strong-willed. Because they’d rather offer incessant excuses to teachers, ignore the advice of the experienced, lose friendships and suffer embarrassment than deal with the problem of Little Johnny. Any rational person would deal with such a problem in their life, but not a bull-headed parent. A bull-headed, strong-willed parent—whose will is set on avoiding conflict with their children—will take what they see as the path of least resistance. And even when that path makes no rational sense, they’ll stay the course. You see, we’re all strong-willed. Our stubbornness just manifests itself differently for each of us. Being strong-willed isn’t a character trait that’s unique to you or your children, it’s a trait that we all exhibit in some form or other. So why should we use it as an excuse for poor behavior? For the unconvinced I’ll offer one final rebuttal…. So what? So what if your child is “strong-willed”? Does that change your responsibility to parent them? Do you believe your child is the first strong-willed child on Earth? If not, do you believe that other parents have found ways to cope with children similar to yours? 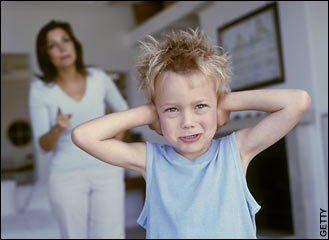 Do you believe that your child would be better off learning to control their strong-will? At this point I’m going to assume that you’ve answered “NO”, “YES”, “YES” in that order, as those are the only sane responses to those questions. So then, parent of a strong-willed child….. If other children have been similar to your child, and other parents have found a way to cope with that strong will, and your child would be better off if they learned to manage their strong will….. Do you love them enough to do what other parents have done? Do you love them enough to make their life better by learning to self control? As toddlers or pre-teens, your children enjoy (to their own detriment) the security of your excuses. But as adults there are no “I’m just strong-willed” excuses that will help them keep their jobs or stay out of jail or keep a marriage together. Your goal shouldn’t be to just survive the first eighteen years of your child’s life. Your goal should be to raise responsible employees, faithful spouses and Christians whose lives reflect not their will, but God’s will. Are you willing to set your “strong-will” on that goal? Because only you can help them accomplish those things. ← I want to be known as a failure.